An updated version of the popular multimedia template RT Quantive from RocketTheme development team with full support for Joomla 2.5. Design pattern is made in a conservative design, which differs from all other templates studio. Thanks to the stylish appearance of the layout, this template is perfect for creating a website. 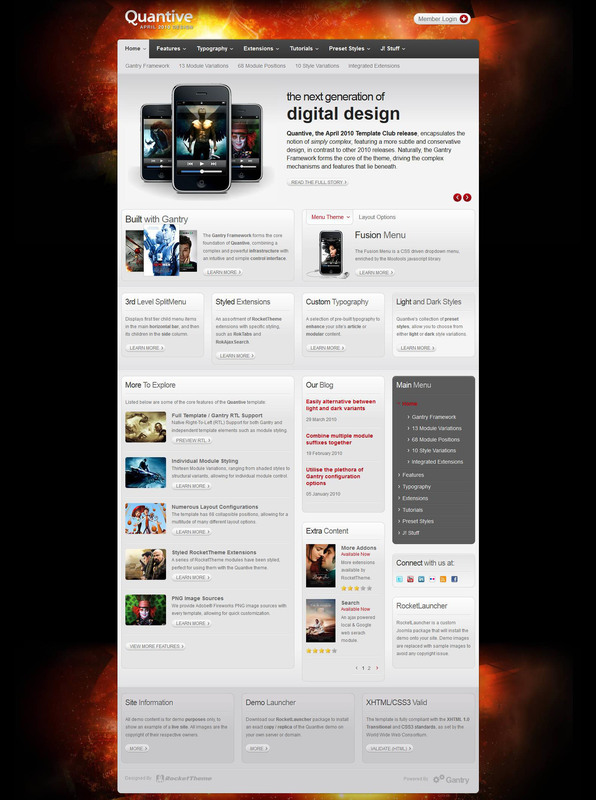 There is a choice of light or dark design layout as well as 10 preset options for the appearance of the site. Corporate freymork Gantry Framework gives high functionality, faster download speeds and an additional set of options template. Flexible modular design contains more than 60 module positions that will ensure optimal placement of all the elements on the site.